1. 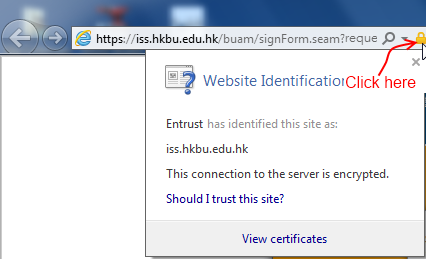 BEFORE entering your password, check and verify the Digital Certificate of this website first. 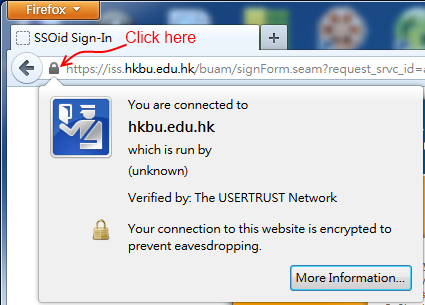 The URL of SSOid Sign-In page should always begin with https://iss.hkbu.edu.hk/buam/, DO NOT continue if otherwise. 2. Do not disclose your password to anyone. (Not even to the colleagues of the ITO Call Centre. No staff will ever ask for your password). 3. Protect your personal data by using a Strong SSOid Password. 4. Never leave a web-session unattended after sign-in and minimize the number of web sessions being opened at the same time. 5. Always Sign-Out and close all browser windows AFTER using the IT services. ✔	 Change your SSOid Password on a regular basis. You will be required by the system to change it at least every 12 months. ✔	 At least 8 characters in length, mixed with uppercase, lowercase, numbers, and punctuation. ✔	 Swap letters with other characters. E.g. Swap s with $, E with 3, O with 0, A with @, i with !, etc. ✘	 Don't use your birthday, name, HKID card number, telephone number or similar numbers. ✘	 Don't use words that can be found in dictionary, or well-known numbers (911, 112, etc). ✘	 Don't use double-words: maymay, stopstop, bobo, passpass, etc. ✘	 Don't use the same password for everything. ✘	 Don't write down or record the password without disguising it.